Bullseye’s seventh international kiln-glass exhibition for early-career artists, documented in a handsome full-color catalog. Photos of artists and their works. Artist statements and bios. Interview with jurors Laura Addison, Silvia Levenson and Klaus Moje. Introduction by Lani McGregor. 2012, soft cover, 48 pages, color. 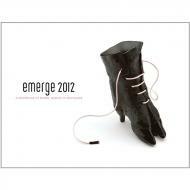 Please note that the exhibition was formerly titled e-merge.